I never learned of this blog until after you had put it on hiatus! 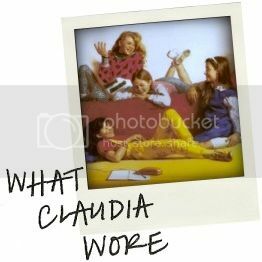 Claudia was always my favorite baby-sitter, and when I learned that there was an entire blog dedicated to her outfits, I had to sign up...only for this to be the lone entry I've received! It's funny...here I am, now in my 30s, and in love with Urban Outfitters. So when you mentioned that you saw so many Claudia inspired outfits in their fashions, I had to smile, because you're of course right--they are very much inspired by her! It makes me smile knowing that, even in my adult years, the pimply, awkward teenager I was, back when reading the Baby-Sitters Club, has found her own artistic expression through Urban Outfitters' outfits, at last! It's as you say, though...life does very much go on. Congratulations on the mortgage (and good luck with it!)! And I am overjoyed at the thought of the podcast! I will certainly be tuning in! There very much needs to be, I feel, a voice in which the books of our youth (The Baby-Sitters' Club, Sweet Valley, etc.) are seen through a feminist lense, and discussed in terms of how they have inevitably affected us over the years. I, actually, have always applauded The Baby-Sitters Club as that which lead to my own feminist awakening: a group of gangly, imperfect, wonderful kids, each with colorful personalities in their own right, comming together as females to form a business of their own, in a world where women in charge is still, sadly, not the norm. This, for me, lent a far more feminist edge to The Baby-Sitters Club than was ever held by the Barbie-esque perfection of Sweet Valley High! Others may feel differently, however, and I'll very much look forward to hearing your take on matters come the podcast! I sincerely hope What Claudia Wore will continue to have a voice, however! Her outfits, as an expression of her, do very much find expression in our adult lives. And a blog dedicated to such a wonderful series was a dream to have stumbled upon...even if I did so just a bit late in the game! Just by saying this isn't the end, you've taken a huge weight off my shoulders! I've had enormous amounts of fun reading through your blog archives and you've totally changed the way I look at contemporary trends. You don't owe your readers a thing. Don't worry, whenever you decide to make an actual comeback? We'll be here. There are many family care and baby sitters organisation. but none could gives us such fatabulous caring like find a nanny Los Angeles.other services related to home and family care is good such as find a babysitter Los Angeles. I like very much after reading its blogsite and website about the imperial service of find a nanny Los Angeles. It is just awe-inspiring when it comes Hire Housekeeper Los Angeles. Its quality services such as Nanny Jobs Los Angeles inspired me gallore times. If you may some need of that of course you will have to visit its web portal. Although this is my first time to visit your blog. But I like your style with fun and comfort. May be you can DIY some t-shirts to memory something from imprints-tshirt. If someone want to know more about the oxford clothing I think this is the right place for you! Great website. I love this website very much. I am very thankful to comment their for blogs and informations.The time is changing as well as find a nanny Los Angeles in present day time it is becoming important to seek the help of popular or reputed nanny services. The important thing about the nanny service is that it is growing with time and you can Hire Housekeeper Los Angeles based on many other good such service providers coming up. Are you interested about that you may visit their web portal for further information by clicking above mentioned links. I still think about this blog and still love it.